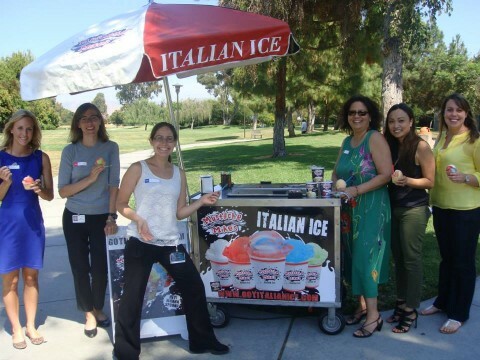 Not sure whether or not to have an Italian Ice Cream Cart or Truck Cater your event? Either option would be sa’weet, but there are pros and cons to having one or the other out when hiring an Ice Cream Truck or Cart to Cater. An advantage with having an Italian Ice Cream Truck Cater is that ‘Food Trucks’ are ‘IN’ and people like the Cool ‘WOW’ factor when they see us driving up to their event or when they see us parked ready to serve them our tasty dessert treats. As long as there’s a parking spot for the truck to park in, the truck can just easily roll in to get the party started for any special occasion! One sweet thing about having Ice Cream Trucks Cater is that since the trucks are bigger (size wise), they can hold & offer more flavors vs. the smaller carts that are limited to serving only a handful or so flavor options. One advantage with having an Ice Cream Cart Cater is that carts are not only very cute, but they’re also very mobile and can easily be placed just about anywhere. We’ve done Ice Cream Cart Catering just about anywhere you can imagine ~ from doing backyard parties, company roof top happy hour events, family reunion picnics at the park, office birthday bashes in conference rooms, and many other places where trucks can’t psychically drive & park. A neat thing about Ice Cream Cart Catering is that carts can do BOTH indoor or outdoor types of events vs. the trucks that are limited to doing Ice Cream Catering outdoors. Whatever option you decide, having an Italian Ice Cream Catering Cart or Truck would be a special treat for you and your guests at your next party or event! Bay Area Ice Cream Truck Catering and Catering with our cute Ice Cream Carts is our specialty so inquire about having Mustache Mike’s come out to your next event! This entry was posted in Blog and tagged Bay Area Ice Cream Cart Catering, Bay Area Ice Cream Truck Catering, Ice Cream Cart Catering. Bookmark the permalink.